Party of 60 or 600? Our catering options scoop them all. Celebrate good times, come on! In addition to our Findlay Market and Northside retail locations, Dojo Gelato offers fresh handcrafted gelati and sorbetti for any event: Weddings, birthdays, anniversaries, office parties, and more. Looking for a truly unique way to celebrate your event on a smaller scale? 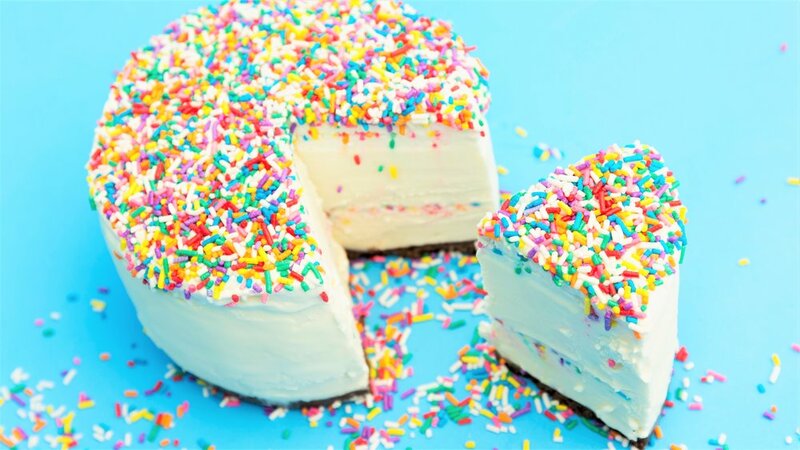 Dojo offers made-to-order gelato cakes, gelato pies, Italian-style ice cream sandwiches, and bombes for all your special occasions. For larger celebrations we offer gelato by the pan, our gelato cart, or our full-size gelato and espresso truck. The Celebration Cake is made with brownie crumb crust, a layer of gelato, a layer of fudge sauce, a layer of sprinkles, another layer of gelato, fresh whipped cream, and a final layer of sprinkles. 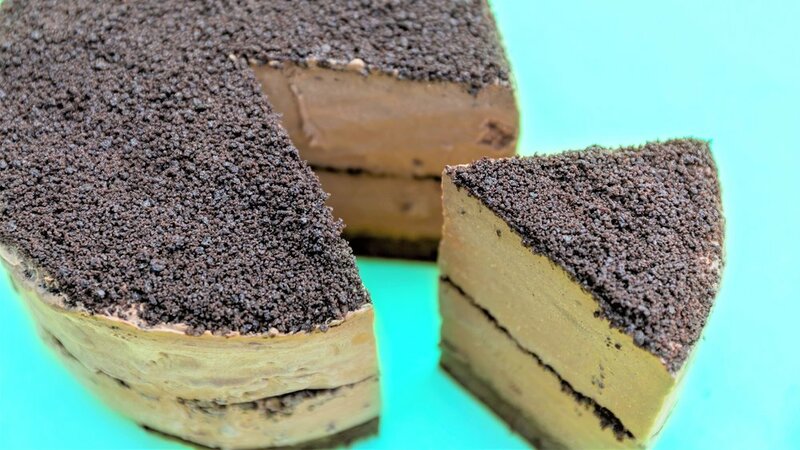 The Chocolate Everything Cake is made with chocolate cookie crumb crust, a layer of Dutch chocolate gelato, a layer of fudge sauce, a layer of crushed chocolate cookies, another layer of Dutch Chocolate gelato, fresh double chocolate whipped cream, and a final layer of crushed chocolate cookies. We also offer a rotating selection of seasonal gelato cakes. Our current selection is Strawberry Shortcake. This cake is made with yellow cake soaked in strawberry sauce, a layer of Tahitian Vanilla gelato, another layer of yellow cake soaked in strawberry sauce, a layer of Strawberry Sorbetto, and a layer of fresh whipped cream. Our gelato pies are made with brownie crumb crust, a layer of gelato, a layer of fudge sauce, and a layer of torched marshmallow meringue. Our bombes are made-to-order and we request two business days for creation. Each bombe serves two ($15) and are a half dozen minimum order. Our bombes are created with a chocolate shortbread cookie crust, packed with gelato, and then topped with a torched marshmallow meringue. We offer two unique Italian-style ice cream sandwiches for celebrations big or small, a chocolate shortbread gelato sandwich or a macaron gelato sandwich. Our gelato sandwiches are made-to-order and we request two business days for creation. Each sandwich serves 1-2 people ($5) ($6 for dipped and rolled) and are a minimum order of one dozen. Our cart offers 4-6 gelati flavors of your choosing, all wares, and 2 hours of scooping service from a Dojo team member. The cart is a perfect option for events with 60 guests or more. Catering fee is dependent on total servings desired. For more details please contact us to request a catering brochure. The Dojo Gelato truck can present up to half a dozen flavors with the additional option of floats, ice cream sandwiches, and a full espresso beverage menu. Our Italian-style ice cream truck is a perfect option for any size event with 60 guests or more. Catering fee is dependent on total servings desired. For more details please contact us to request a catering brochure. Looking for a more intimate alternative to our gelato cart or truck? We also offer gelato by the 5 liter pan. Each pan serves about 40 guests ($75). All of our gelati is made-to-order and we request two business days for creation. For more details about Dojo Gelato's catering and special event services, please complete and submit the form below. Thank you for contacting Dojo Gelato about our catering services. We will be in touch shortly.